I recently gave a presentation to a post polio group on a post polio syndrome exercise program – especially as it relates to members of that group with osteoporosis or low bone density. New research is indicating that polio spread wider than the visible part of the body affected by polio. This has implications for exercise that runs counter to recommendations for the general population. We encourage the general population to push through their exercise program. This advice does not work for a post polio survivor where rest plays a crucial role. As a result the Physical therapy prescribed post polio syndrome exercise program must be different than a general therapy exercise program. 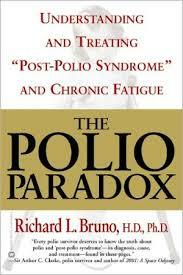 This topic is covered in Dr Richard Bruno’s book, The Polio Paradox. Hi, I’m Margaret Martin at MelioGuide and today, I’m going to share with you exercise prescription for a very special population, and that population is the post-polio group. So years ago, we used to be really concerned about survivors of polio. And then, as they grew up, we really focused our attention and rehabilitation on their affected limb. We now know from research that their affected limb was not the only muscles that were affected. In the Polio Paradox by Dr. Richard Bruno, we have come to realize that not only the arm or the leg that we see symptoms of the polio in their bodies were the affected muscles, but rather all of their muscles in their body were affected, just to a much lesser degree. And so now as they age and as post polio syndrome develops, what the symptoms of pain and fatigue and decreased function, are all coming about because all the muscles were affected to some degree. And so, when we look at polio what initially happened, the virus attacked the motor neurons and so the nerve, a motor neuron is a single nerve innervating muscle fibers. So this one nerve can, instead of only innervating five muscle fibers, the healthy nerves that were remaining, start to innervate five more and five more and five more. And so that one nerve, now had a much bigger load to carry. It was carrying many more muscle fibers. But as people age, these motor neurons are getting fatigued. If people with polio follow the prescription of work harder, exercise harder, go to the point of fatigue, get out there and work, you will actually cause yourselves more damage and more harm. So the recommendation for a post polio syndrome exercise program is to do only non-fatiguing exercises. You would do only half as many repetitions to a point that if you know that at ten repetitions, you start getting pain or weakness or fatigue, then your prescription is only five repetitions, and this is so very important that you’d listen to your body and work to the point of any of these symptoms. If you have a muscle that does not have any anti-gravity strength, meaning you can’t lift against gravity, then not even non-fatiguing exercises should be prescribed for those muscles. So for those of you who managed to give a talk to in the outer chapter of post polio survivors, and you’re wanting to have more backup when talking to your therapists or your trainers, please have them listen to this blog and encourage them to read the Polio Paradox by Dr. Bruno, so that you get the support that you need to stay as strong as you can and stay as functional as you can through the rest of your lifetime. So this is all for MelioGuide today. I’m Margaret Martin. I’m in my 50’s and have had left leg muscles wasted from a childhood and polio affected. I need to do exercise and would want to know more about specifics of how and would appreciate some guidance in this regard, equally there isn’t much support group here and especially people who are affected to share past experience etc.